Setting big goals has made Sage Kimzey one of the best bull riders in the history of the PRCA. He still has goals to accomplish and he has made his ultimate goal well known – to be known as the best bull rider ever. He is entering his fifth Wrangler National Finals Rodeo in first place, a position that he is very familiar with. It is where he has started the NFR every year that he has entered the Thomas and Mack Center. And the previous four times, he has left with a world championship. This year’s qualification came about differently. He broke his pelvis at a Championship Bull Riding event in Enid, Oklahoma in January. That meant he missed big rodeos in Denver, Colorado and Fort Worth and had to sit out until the middle of February – just in time. Sage entered the San Antonio Stock Show Rodeo on the 12th of February, rode five out of six bulls and won $17,502. He also competed at the Xtreme Bulls, rode both bulls and finished third to win $16,000. He set a goal to come back strong and finish the season with $300,000 won during the regular season. He nearly accomplished the second part of that goal and will start this year’s NFR with $297,026. Adding that to his career earnings since joining the PRCA in 2014 and he is closing in on $2 million with $1,711,697. 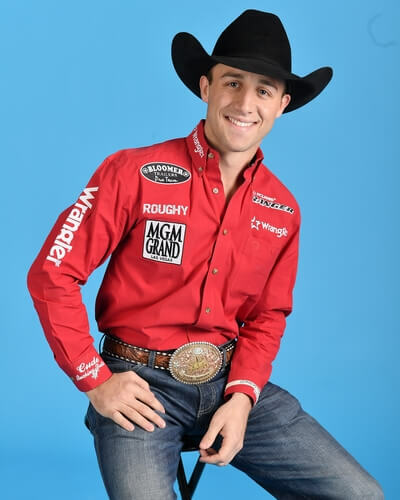 Considering that he won $193,135 at last year’s NFR it won’t be long until the 24-year-old adds that to his rodeo resume. Sage’s success in the arena is multi-faceted. His injury list is short and until last year was filled with minor and expected strains and bruises. He set his goals as a youngster and has been training for them ever since. He reads a lot of sports psychology, and studies it every chance he gets. That has added up to four world titles with a fifth within his grasp. His goal isn’t to just match Donny Gay’s record of eight, but to win nine and stand alone in the record books. He has also been smart outside of the arena, using his money to prepare for his future. He bought a house in Salado, Texas, much easier to catch flights from than Strong City, Oklahoma, which he still calls home. The only splurge he has made with his money was buying his dream car, a white Corvette with red interior. Along with using his mind to be a great bull rider and being thoughtful about how he spends his money, Sage also thinks of others. He loves opportunities to encourage young kids, say hello to his fans and knows that rodeo has given him a platform to do that. As he competes at the NFR for the fifth time on rodeo’s biggest stage, his platform just got a little bigger.